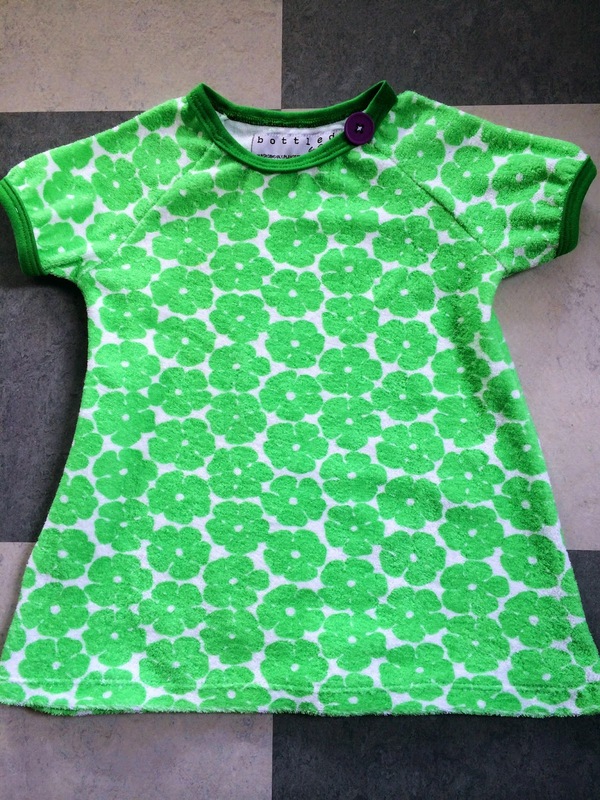 A blog about sewing, crafting, and organic living. This month has been a roller coaster. I nearly caved in and turned back to conditioner again in my first week this month. Then I read somewhere that week 5-6 are generally the hardest weeks when switching to WO and you need to work past those particular weeks before deciding if WO works for you or not. That was encouraging in the sense that I wasn't alone in this experience. Gotta hang in there a little longer! What was particularly bad about week 5? My hair felt sooooo dry and brittle!! 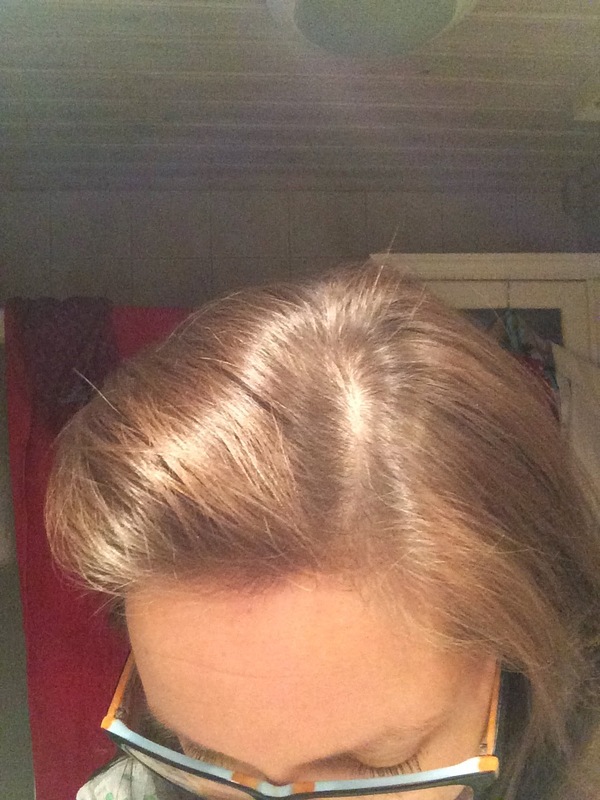 The roots did not feel oily at all and also the tips of my hair felt nice, soft and hydrated. It was the hair in between that was awful. It felt like hay! It was as if the sebum had hardened on the shafts and would no longer be brushed away with the BBB. Then on day 8 something happened! My hair suddenly turned soft again! The hardened wax became more oily again and started to be absorbed by the hair!! Can you see it in these pictures? How about week 6 then? This has really been my breakthrough week! There has not been one day that I haven't absolutely LOVED my hair! So light, fluffy, shiny and soft - every day! No heavy feeling anywhere. No waxiness. Hardly any brushing necessary. And also, my hair has become even more wavy - bonus! 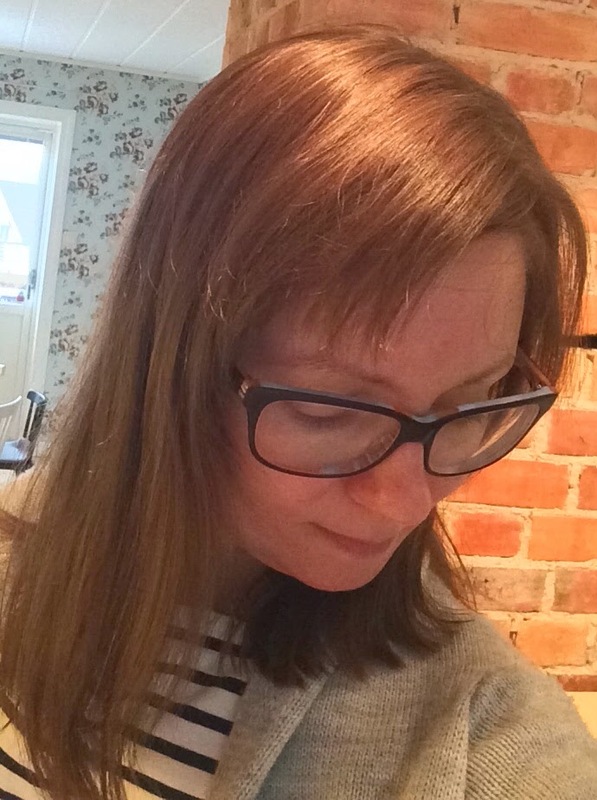 Last week I was ready to divorce my hair for good. This week I am completely in love. Roller coaster, all right! My advice to anyone trying out WO out there would have to be - don't give in!! That week around week 5 when everything seems particularly bad - it will get better!! No oil or waxiness. I brush with the Boar Bristle Brush 1-2 times between washes (so in reality around every 3-4 days) but not nearly as thorough as in the first month. The WO wash it quite quick too. I'd say it doesn't take any longer than a "normal" shampoo+conditioner session. 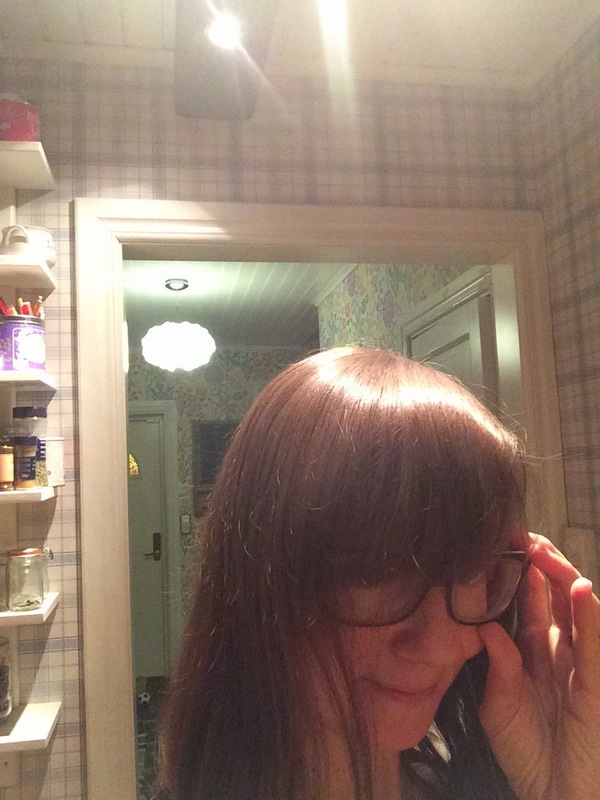 My hair has now become that trustworthy that I decided to cut my bangs again! I've been a little hesitant since nothing can spoil a good style like greasy bangs. 5 days after washing, still no BBB. 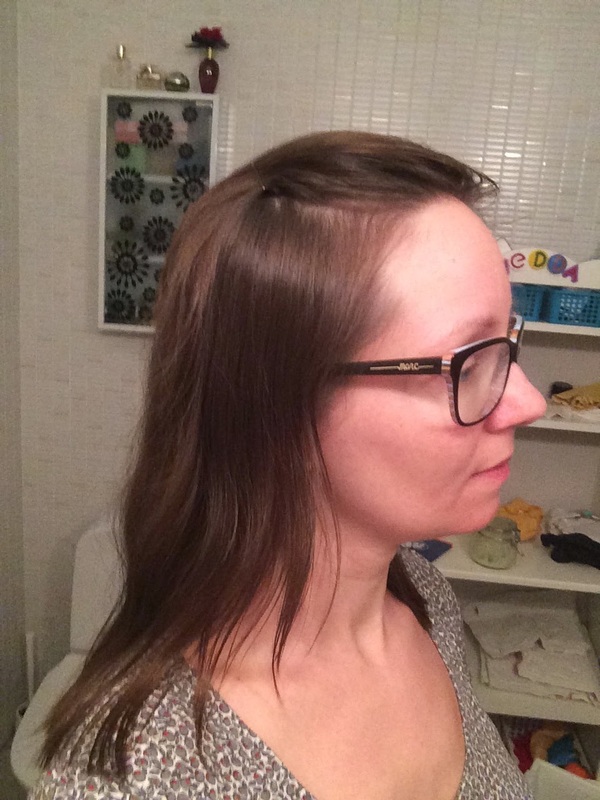 In the second month I've WO-washed my hair 3 times (roughly 9 days in between washes), used BBB 1-2 times a week. Do I want to continue? YES!!!!!!!!!!!! Anyone else on the WO bandwagon? I've had this pattern i stash for almost 2 years and never been completely sure that it was for me. So I never touched it. But it has been on my conscience since I HATE buying things and not using them - it's simply not in line with my style of life. Now I wish I had sewed it sooner because it is AWESOME!! 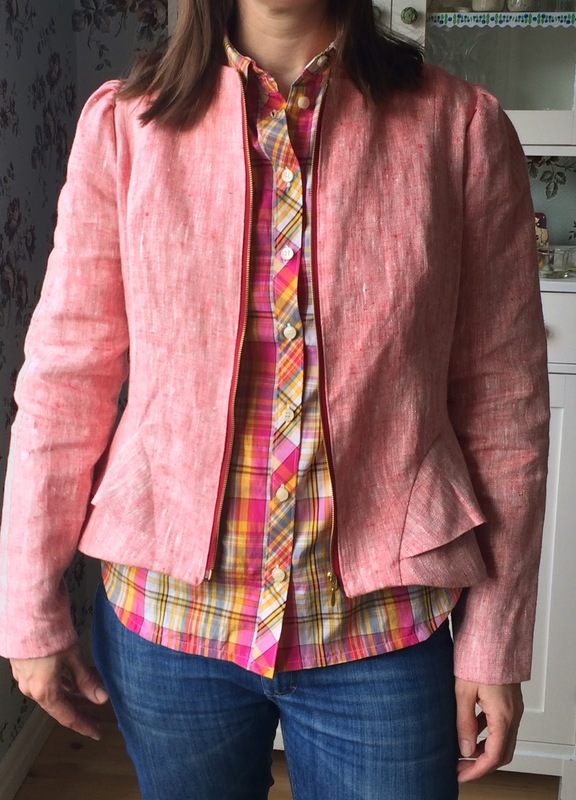 What a cute, light, summery yet stylish jacket this is! Work approved too! 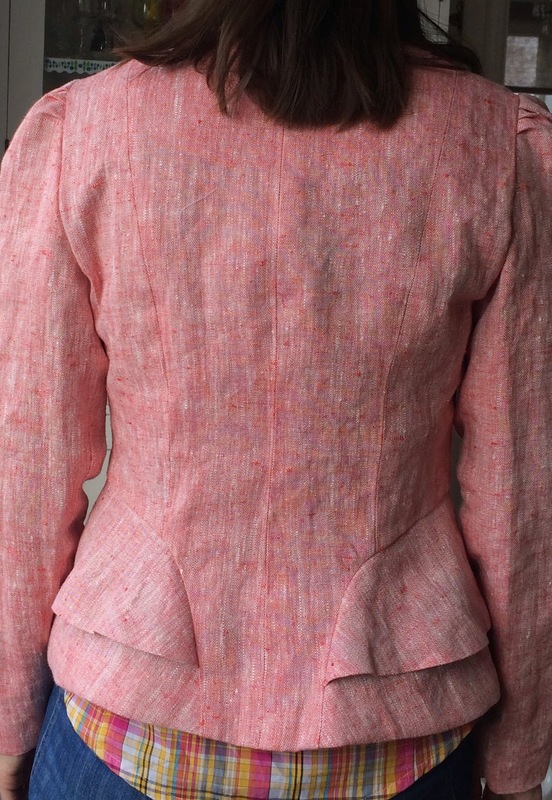 I sewed it in a medium weight linnen (it is light red, NOT pink!!! ), added a gold metal zipper and lined it with a bright, happy turquoise fabric. The only adjustments were a small FBA and that I had to reposition the sleeves somewhat. The puffed part were sort of hanging off the shoulders and needed to be moved in a bit. I also moved the sleeves slightly forward to be able to move my arms more freely. I really recommend this pattern! PS. The shirt underneath is another Granville shirt that I'll write about some day soon. 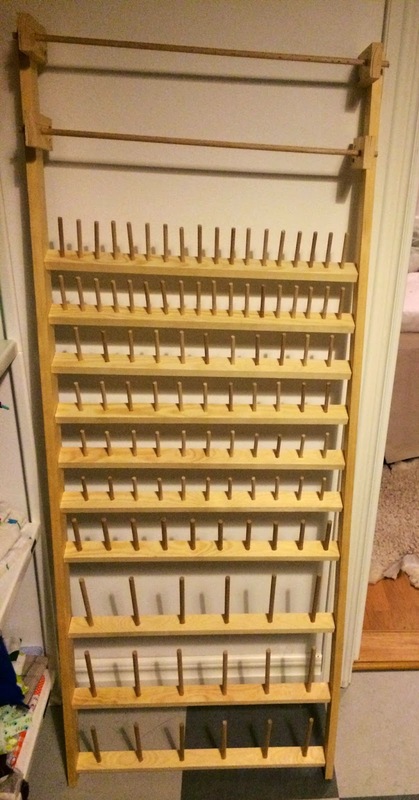 Completed: a home made thread rack! Anyone else having problems with storing those spools of thread and getting jealous of the pretty ones that 'everyone else' seems to have, that would turn that mess a tidy display of beauty? And then when you decide to buy one - there aren't any to buy?!?!?! No? Well, this was it for me. And then what do you do? YOU BUILD YOUR OWN! This is the one I made. If you want to know how, keep reading! This rack has the finished size of W50 cm H130 cm (19,5" x 51") and it accommodates 90 spools and 18 cones. I had now drawing so I had to go with an idea that I had in my head. I went to a hardware store and bought some material. One tip before you go shopping is that you put a couple of different spools in your pocket so that you can try out what dimensions you need. 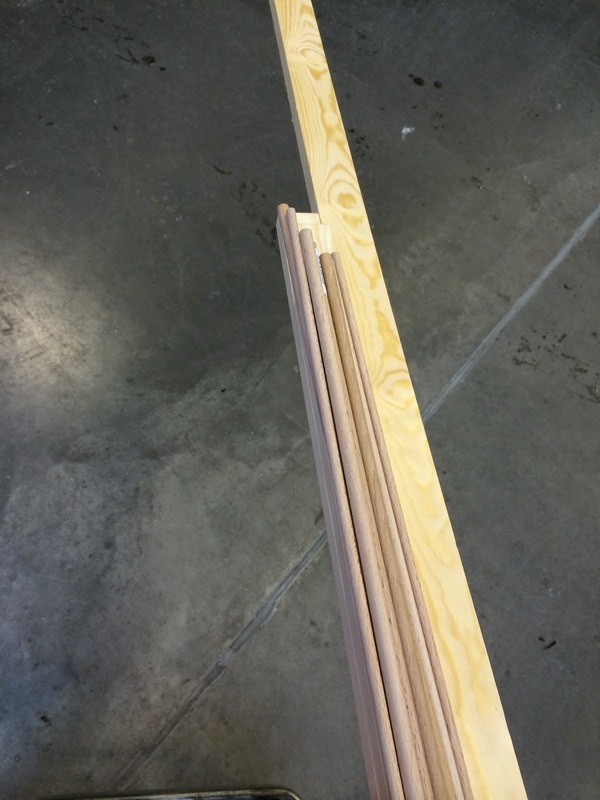 You want the sticks to be as sturdy as possible, but they also need to fit the hole. 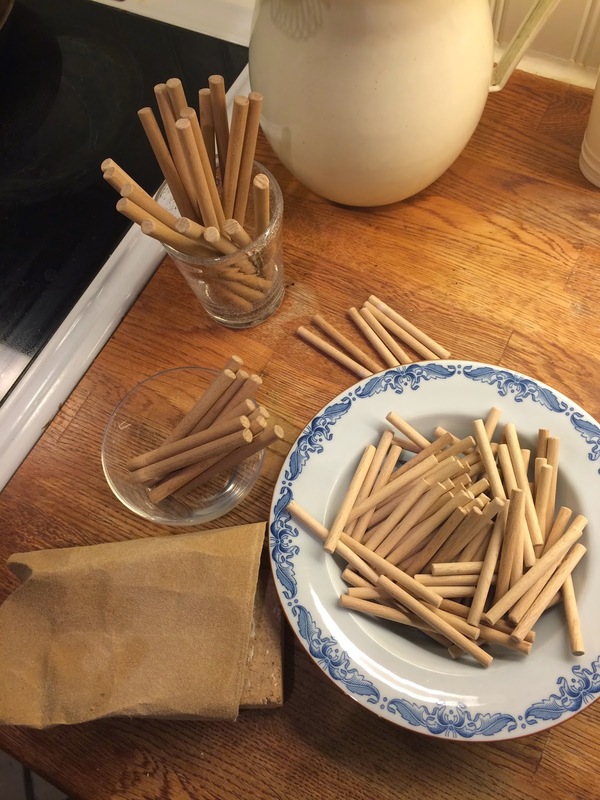 I bought 2 different thicknesses of round sticks (is that the proper term?) and two different dimensions of untreated moulding for the frame and "peg holders". 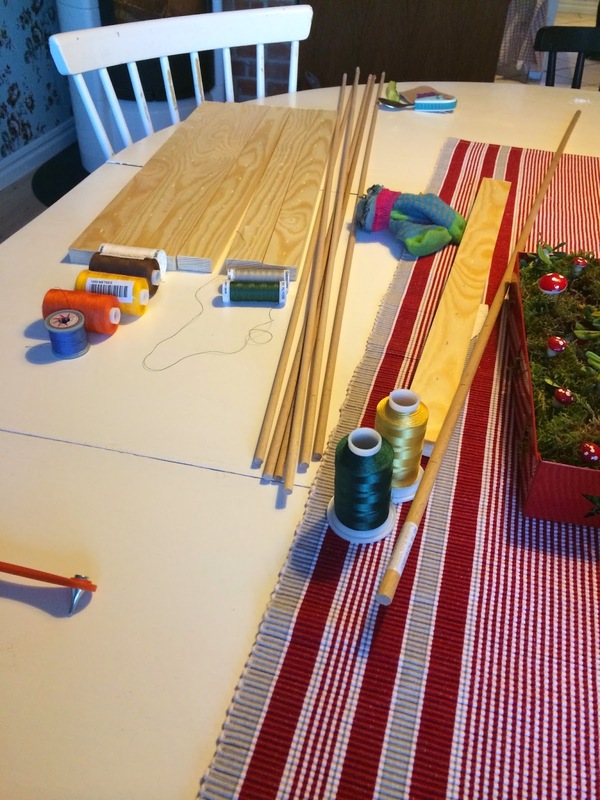 Other things you need are wood glue, drills with the same dimensions as the round sticks, self drilling screws (for moulding so that they don't split too easily), a saw, and sand paper. Now let's start the construction work! This part I made up as I went along. First you need to decide where on a wall you want to put it so that you know if you have any boundaries width- or length wise. One thing to think about is to avoid a wall in direct sunlight if you can, to give your thread a long and happy life. Then, when having decided the measures you want for the frame you can cut the peg holding mouldings to pieces of that same width. You don't have to calculate exactly how many you need just yet, if you don't want to. I only had mouldings enough to make 10, so that is what I made. Next step was to decide how many spools of various dimensions you would like to accommodate. Do an inventory and see what you have more of. I basically have 3 dimensions of regular spools and then I also have large cones for the overlocker and cover machines. 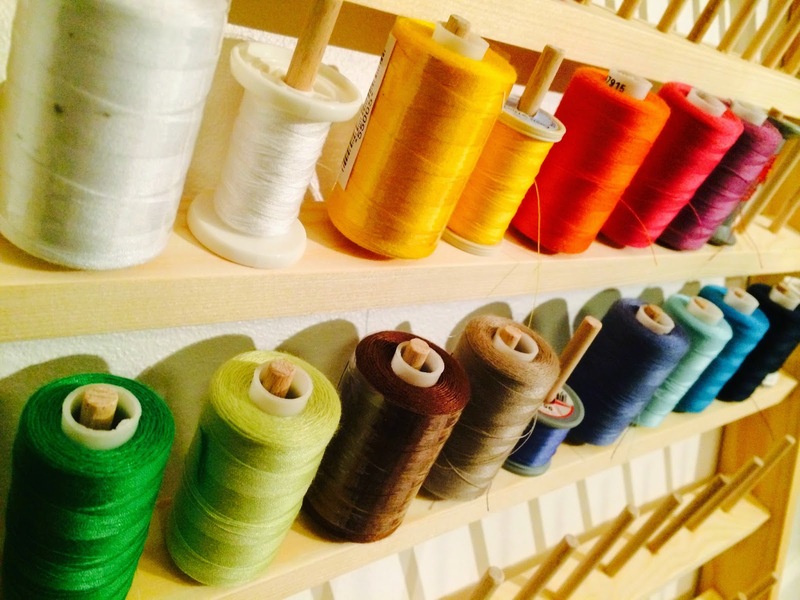 The smallest spools are the Gutermann thread spools. These pegs can be places rather closely on the peg holder. When you have decided how many you want of each kind you can measure what peg length you want for each kind and then you need to saw all the round sticks into pegs. 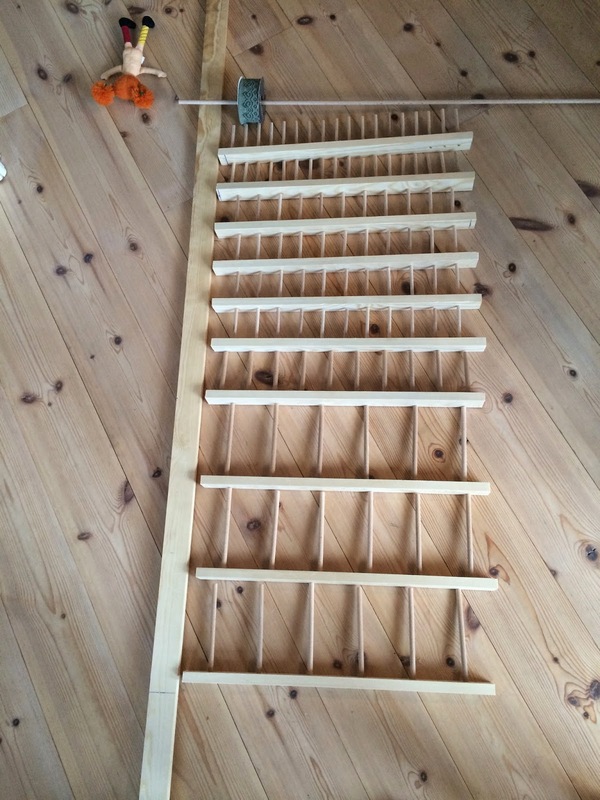 And when done with that you also need to sand one end of the pegs so that you don't have any sharp edges. This is important but boring. Don't skip this step though. 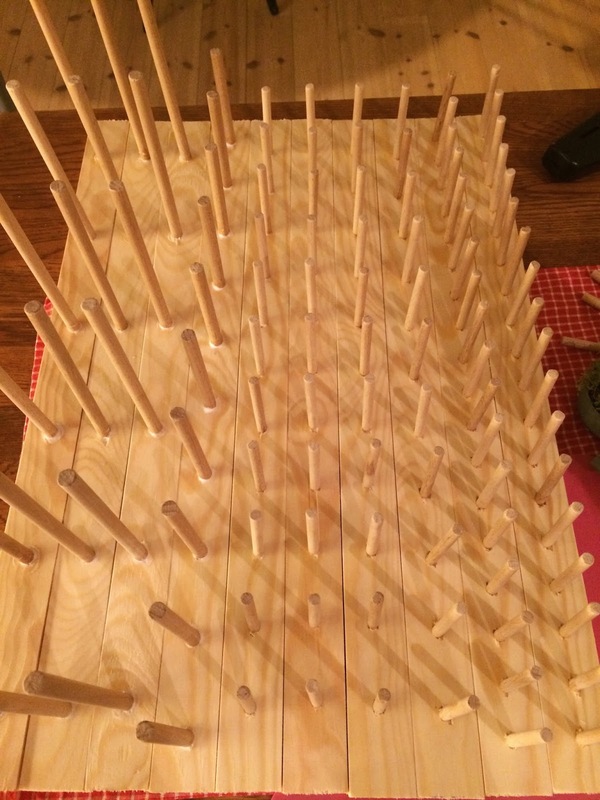 When this is done it is time to take the peg holders and mark how closely you want the pegs. Make sure you double check with actual spools so that you don't put them on too tight. Also make sure they are evenly spread across the length so that it looks neat. 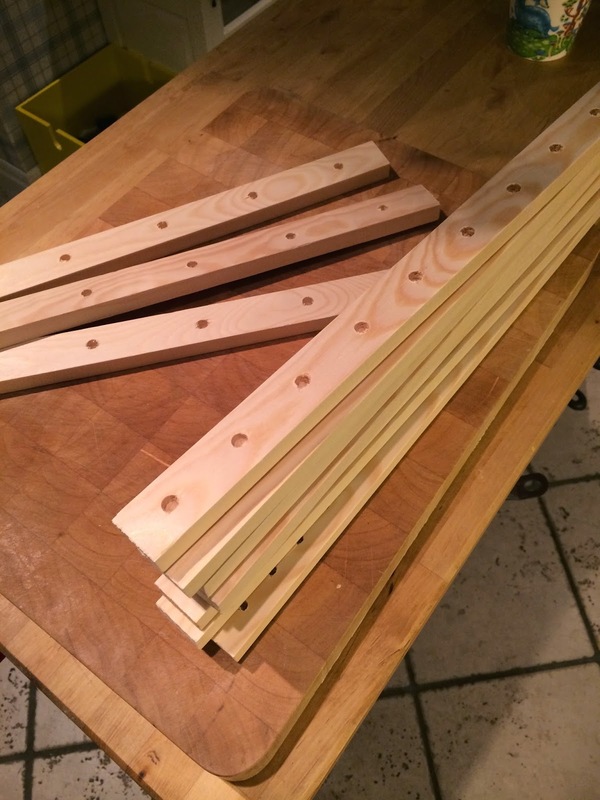 Drill a hole for each peg. Not all the way through, halfway is enough. Now, put a dollop of glue in each hole, don't do too many at at time. 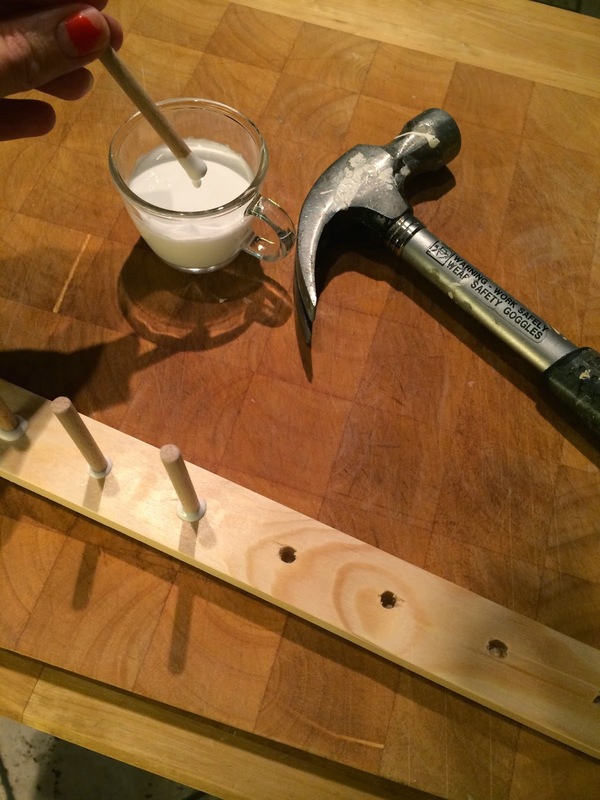 Put a peg in, tap it down with a hammer, and wipe excess glue away. Try to get them nice and straight. Leave them to dry. Before the glue is dry, do any final adjustments so that the pegs are straight in every direction. The next step is to decide on what distance you want the peg holders from each other. This is easily done by putting them "on top of each other" on the floor. They will be angled later, so this is not too close. Mark this distance on the side pieces. Then screw into place. Note! The best way to do it, in my opinion, is to set only one screw on each side to begin with. Then you can tilt the holders and try out different angles (try with the spools!!!!) before deciding how you want it. Then put the second screw to have it secured properly. Now, put your rack on the wall and you are DONE! In my parenting philosophy I feel strongly that I don't want to limit my children by forcing them into a shape decided by society, but I want them to be who they really are and pursue interests of their own choices. To do that, I want to offer them everything, not "dolls for girls and cars for boys". Anyway. We have managed to sniff out toys made of wood and metal for most things, but we hadn't "solved" the doll thing. 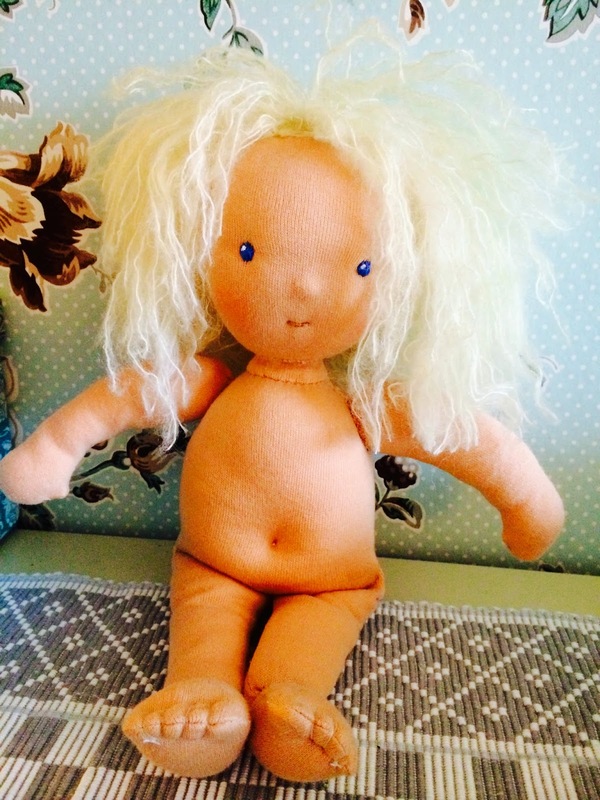 And then it hit me, why not SEW a doll!!! I men, duh?!?!? I can't believe it took me so long to crack that one! Said and done. 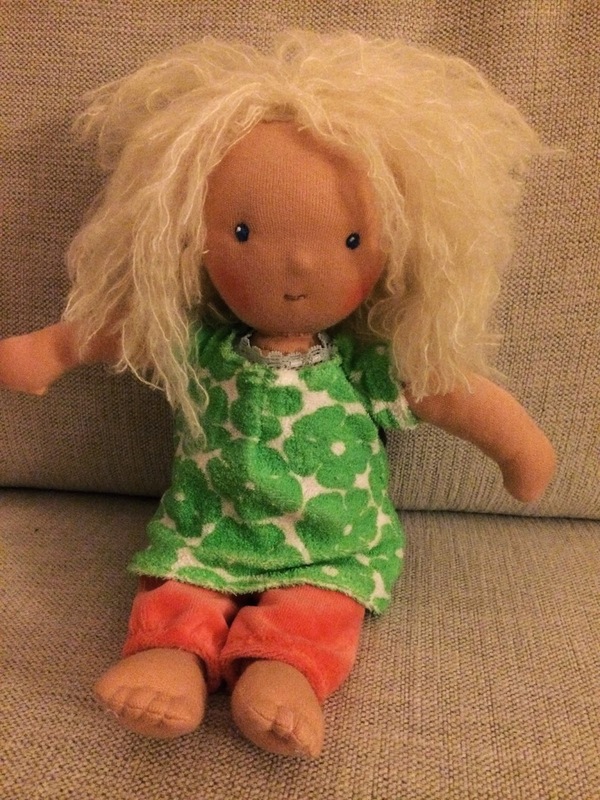 I spent an hour on Pinterest and pinned all the waldorf doll sewing tutorials i could find and off I went! 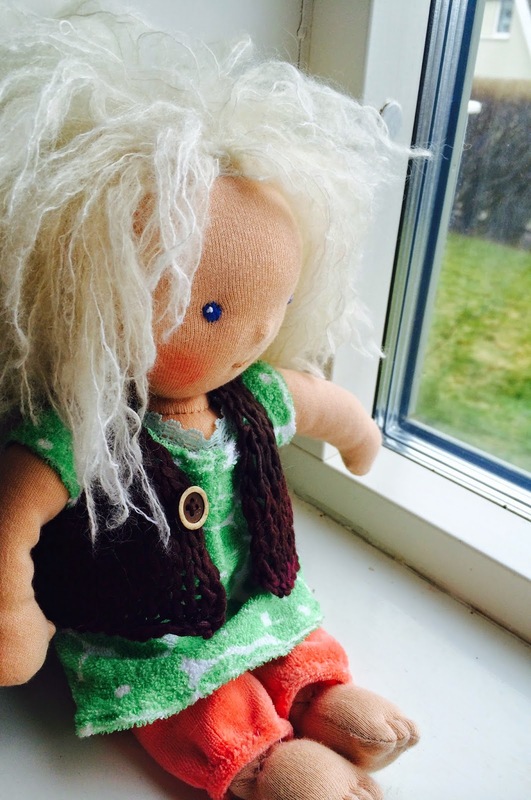 May I introduce..... - The first homemade doll of my life!!!! She is made from organic cotton jersey, stuffed with wool. The hair is croched from mohair yarn, and then dyed with tea to make it more off white (than white). Ain't she cute? A little belly button and cute little toes! Now, let's hope she likes it!!! We'll see this weekend. 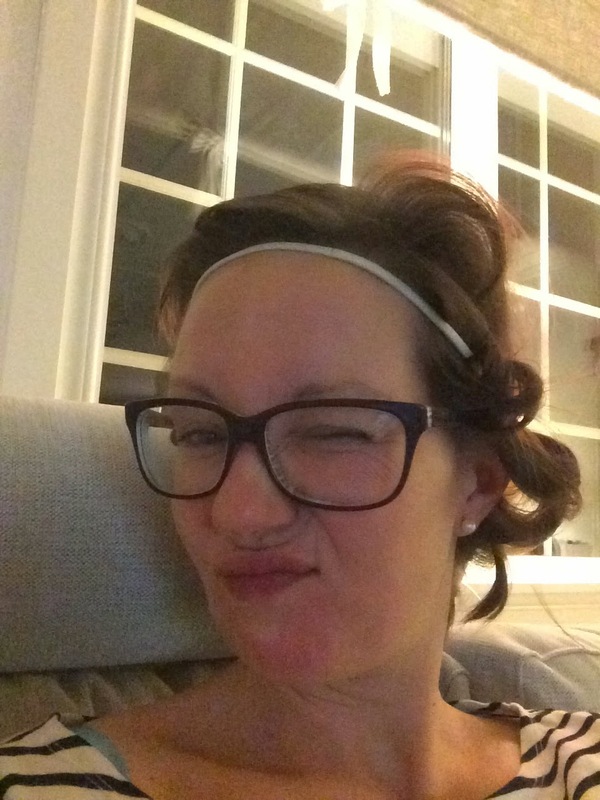 No poo update - Switching from CO to WO! About a year ago, i wrote a post on soon being ready to switch from Conditioner Only method to Water Only. Well, it took me another year to take that step for some weird reason. I guess it came down to that i was starting a new job, hence being weary of coming across too much of a hippie (I'm a management consultant). But NOW I've done it! Yay! Why am I doing it? I want my life to be easy and uncomplicated. I don't like the idea of relying on "products" and I in general like to strive to achieve some balance in what is natural to my body. The ideal outcome of this would be that I can do WO a couple of times a month, have beautiful, healthy, fresh and manageable hair with minimum effort. Plus, what can be more organic than this? So let's see now if this can be achieved or if I'm back to CO in a little while, shall we? I though I might do a monthly update if anyone is curious about how I'm getting along. Massage my scalp thoroughly for a couple of minutes. Brush entire hair with a BBB (Boar Bristle Brush) for about 15 minutes to try to move as much sebum as possible down to the ends. Then jump in the shower. Massage entire scalp in the shower in hot water (helps removing excess oil) for about 5 minutes and rinse thoroughly for another couple of minutes. 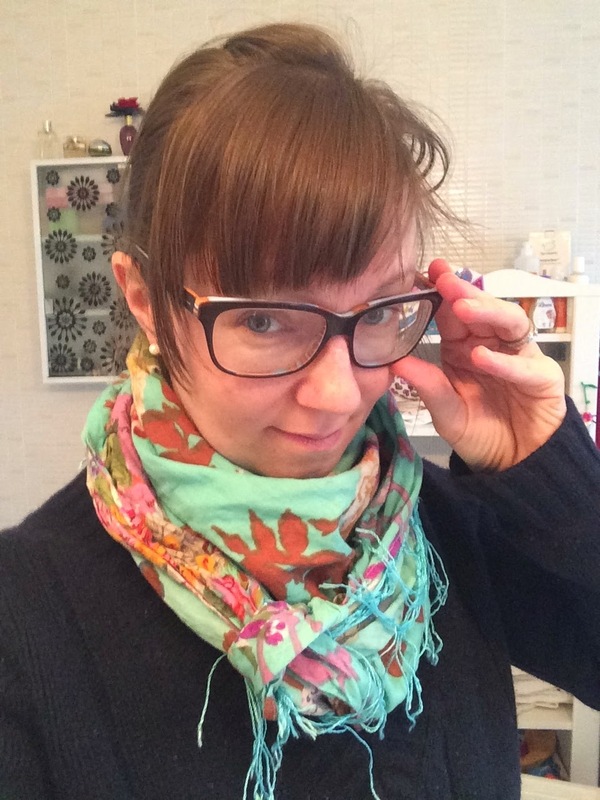 I try to pay extra attention to my areas that tend to get oily more quickly: the fringe and the back of my head (opposite point to the chin). 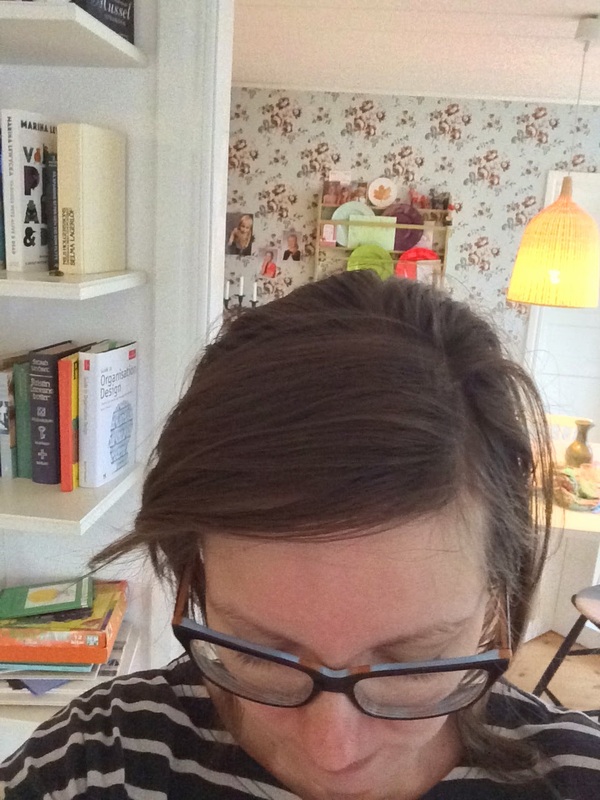 When I'm done I wrap the hair in an old t-shirt for like 20 minutes and then comb through with a wooden comb. Air dry. Many people suggest you should "scritch and preen" which means you should massage your scalp with your finger nails to loosen up the sebum and then pull the sebum down your hair with your fingers. I have tried this, but haven't got the hang of it. It rather feels like I'm tugging on my hair and causing it stress. Also I don't think any oils are really moved. Maybe I'm doing it wrong, but I have now ditched that method. Instead I gently massage my scalp for a couple of minutes every night and then I use my BBB on SMALL sections of hair until I have brushed all of it. It may take me 15-20 minutes, so I do it in front of the TV before I go to bed. When this process is done, the hair often looks kind of gross, because now you can see the sebum on your lengths! When I wake up in the morning it looks great though - all the sebum is absorbed and now naturally protects my hair. The last thing I do EVERY DAY is to clean my BBB. I use this method and it works great! This process is easily done while I brush my teeth and such. I don't think it is a hassle at all, actually. I also braid my hair before going to bed to avoid bed head. Just for precaution, it has never really been a problem for me. 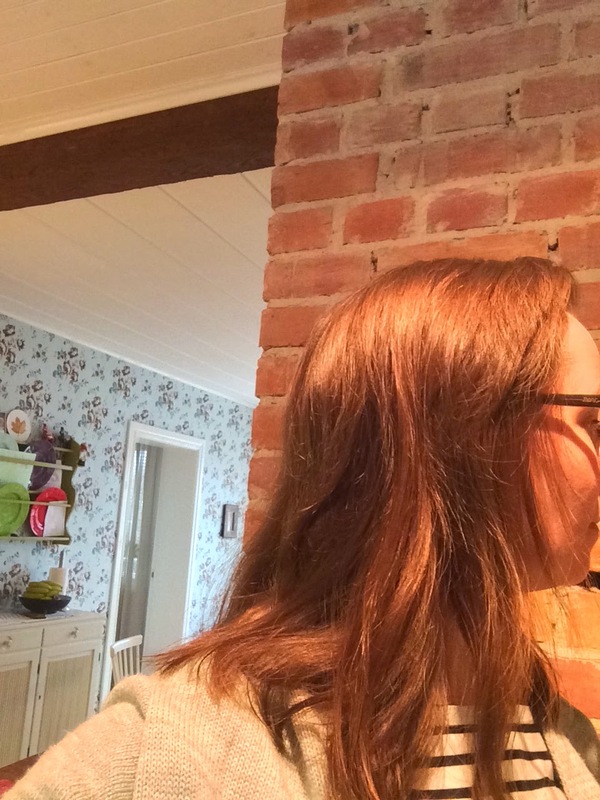 I quickly brush my hair with a wooden brush (not the BBB). That will detangle and smooth the hair and I am ready for the day. 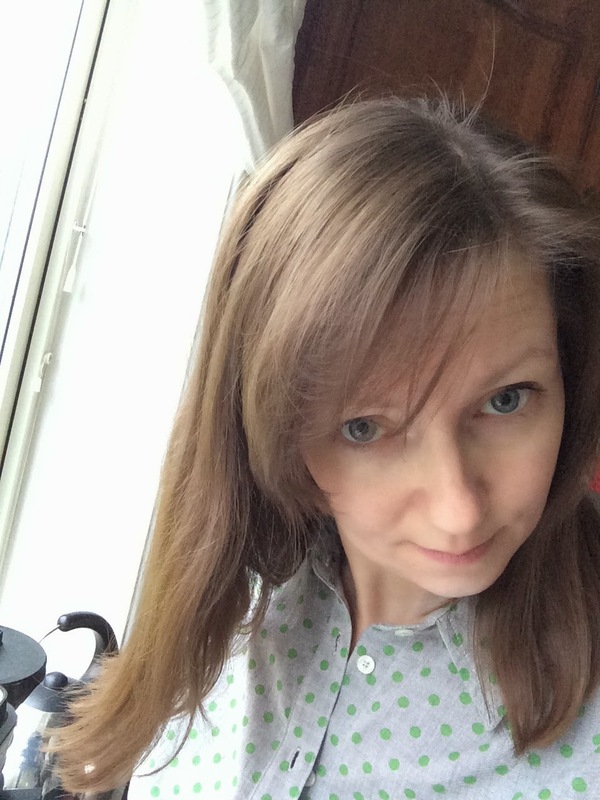 I have during my first month (February 2015) washed my hair with water only 4 times, i.e. once a week. I am very impressed that this actually works! 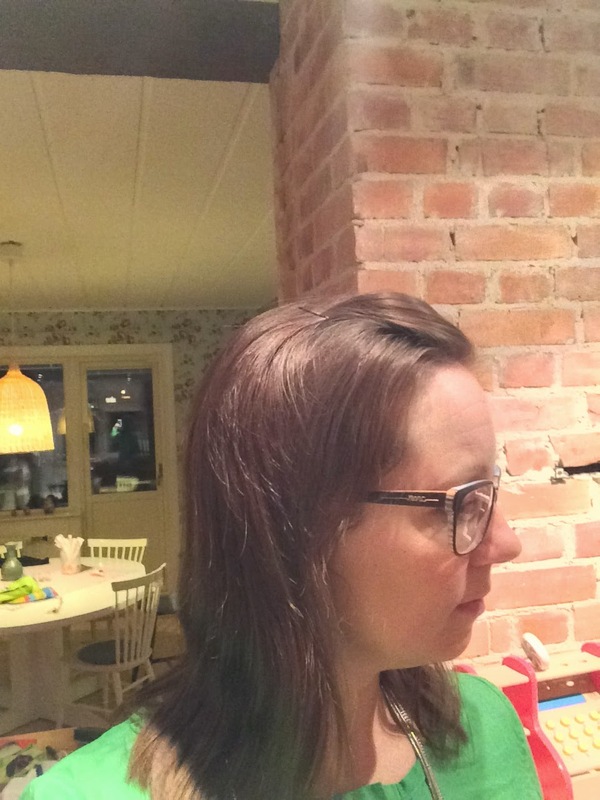 My hair gets very shiny and has much more body than before. My transition period seems to be kind to me. Maybe due to the gentle CO washing I was used to? 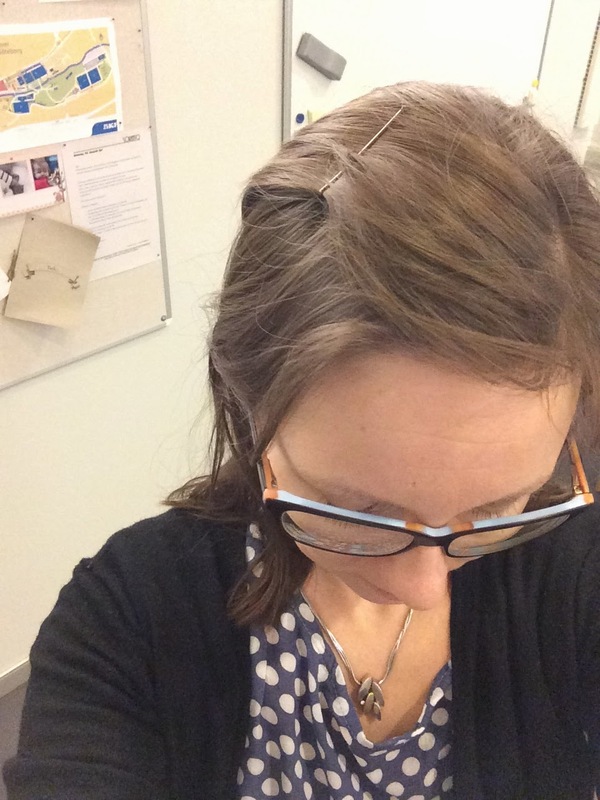 My hair feels much less greasy around day 5 (when it is at its worst) than with CO or shampoo. I've also noticed that around day 6 it sort of swings around and becomes less oily again. I think I could go longer than a week between washes quite easily, but for now I think I'll stick to it. I have asked my husband to really smell my hair at various stages to see if it in any way would seem gross and he thinks it smells clean. I think that too - relief! It both looks and smells clean - yay! 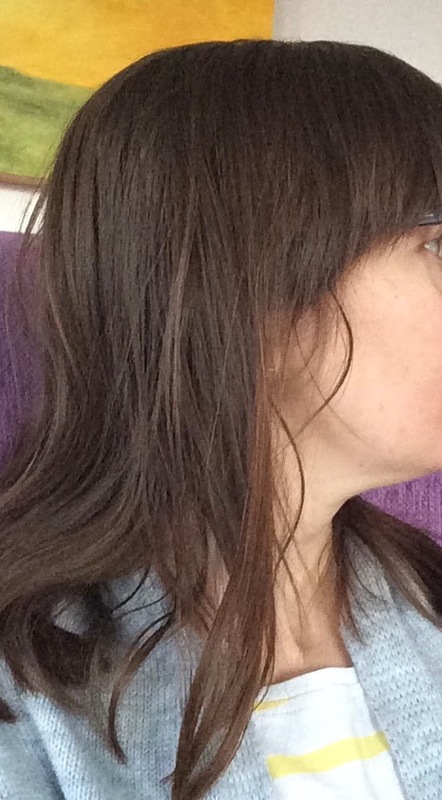 I have also noticed that my hair tends to get slightly wavy, whereas I've always had very straight hair before. I wonder what will happen with that going forward. My hair gets VERY clean from the washes. I actually think I should wash less thorough, because it almost feels too clean after the wash. Weird. I need to play with different temperatures during the next month I think. Another reflection. I expected my hair to become suuuuper soft (I've read that is to be expected in WO) but that is not really my experience. Maybe for the first 2 weeks, but now after a months I don't think it is super soft at all. It is not super stiff either, but it has more hmm structure? than before. 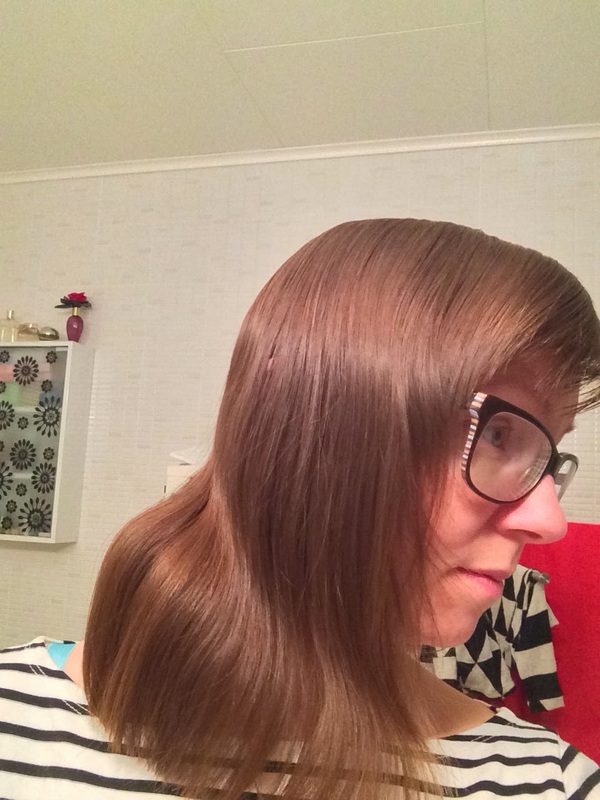 I also start to notice that my ends are becoming more dry (you can almost see that in the pics below. So maybe I need to experiment with adding some hair oil or aloe vera or something to the ends. One week WO - BEFORE wash. I am into making stuff. 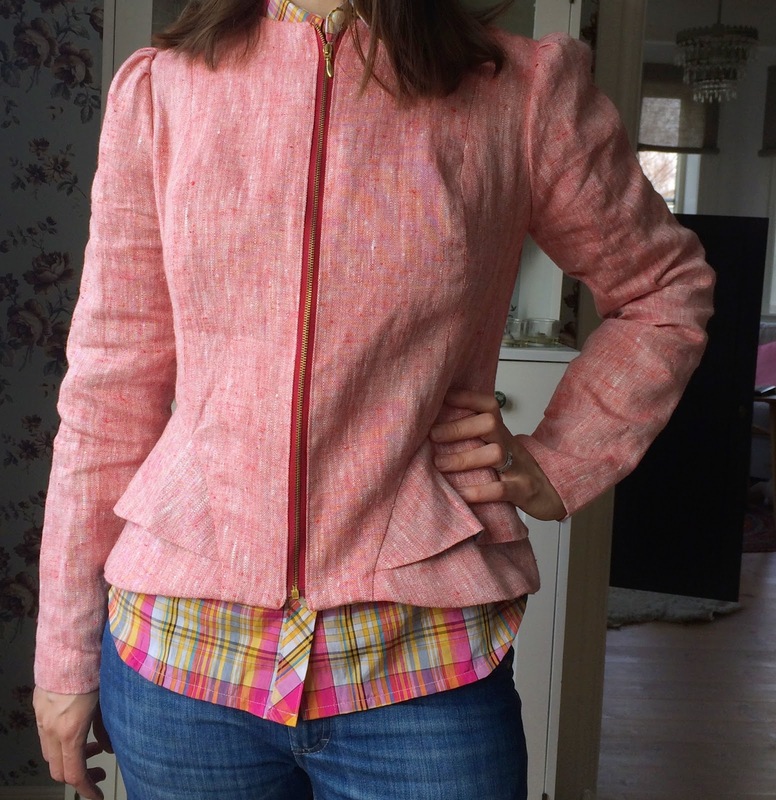 I like swinging a hammer, knitting, painting and lots of other things, but above all - SEWING is my passion. 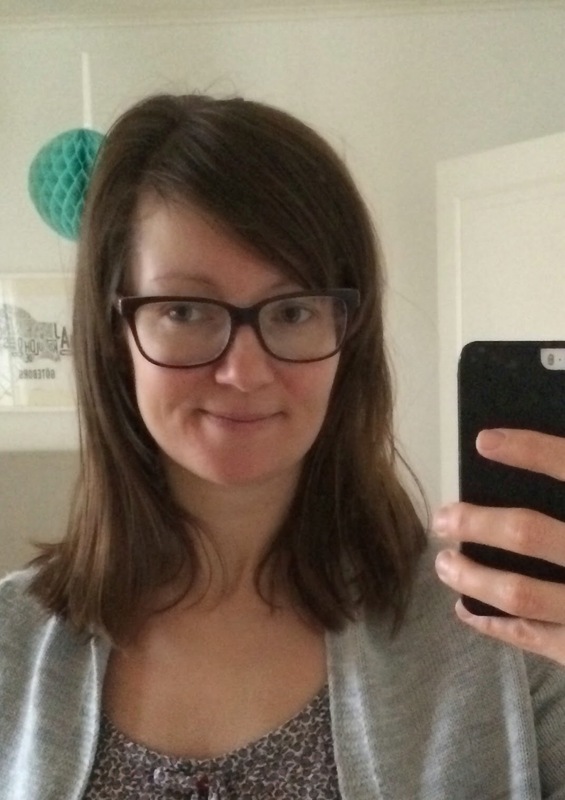 I am a mother of 3 girls with a challenging career on the side. I like to make the world a better place by doing a little something everyday such as making organic purchases, making no purchases, eat less meat, buying used/second hand stuff. This blog may cover most of these parts of my life, or not. We'll see. Welcome! Peace and love from me to you. Simple theme. Powered by Blogger.